Williams Sonoma is one of my favorite sources for yummy recipes that always work. This one I have been making since we opened our Bed and Breakfast almost 14 years ago. It is from their muffin cookbook. As a rule, I use King Arthur all-purpose unbleached white flour. 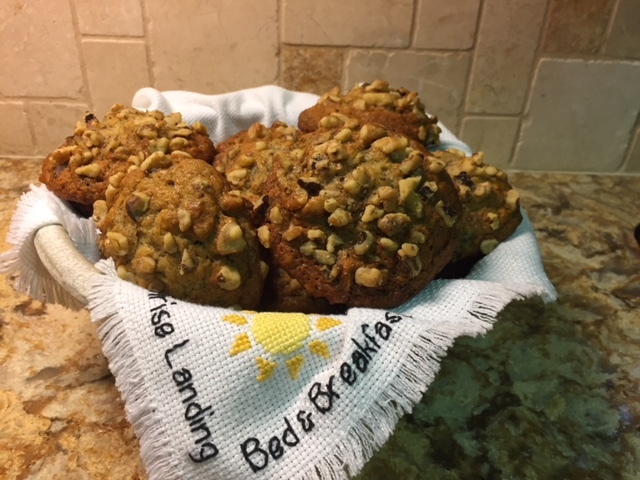 For Gluten Free guests I now use King Arthur, Gluten Free Measure for Measure Flour Mixture and it works so well that when I have guests who require Gluten Free, I serve the Gluten Free to all guests, and still get rave reviews. (I use King Arthur all-purpose unbleached white flour), or use Link for Gluten Free Measure for Measure Flour mixture. A few other adaptions from the original recipe have been made through the years. Preheat oven to 375 degrees. Grease 10 standard muffin cups with non-stick spray (I line the pan with aluminum foil baking cups). In a bowl, stir together the flour, sugar, chopped walnuts, baking soda, and salt. In another bowl, whisk together the oil, egg, mashed bananas, and buttermilk until blended. Add the dry ingredients and beat well until evenly combined and creamy. Spoon the batter into each muffin cup, filling it level with the rim of the cup. Bake until golden, dry, and springy to the touch, 20 – 25 minutes. A toothpick inserted into the center should come out clean. Transfer the pan to a wire rack and let cool for 5 minutes. Serve them warm or at room temperature. No Replies to "Banana Muffins"